Based on the title of this post you're probably wondering, is this about two men?.. or not. But anyway, someone brought BOBS which is a brand by Skechers to my attention of their obvious knock-off of the widely popular shoe brand, TOMS. 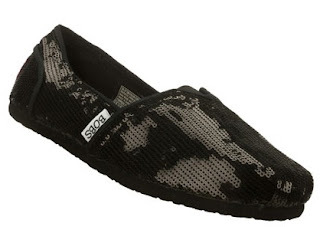 Skechers, the brand those tricked everyone that Shape Ups really help tone your legs, is stepping onto TOMS territory. Every hipster I know has a pair of TOMS, they're really comfortable, inexpensive and more importantly purchasing a pair of TOMS shoes and a pair will be donated to a child in need of shoes in Africa. Lets turn the page over to BOBS, they're really comfortable (I guess), inexpensive (roughly $10 less than TOMS) and purchasing a pair of BOBS shoes and a pair will be also donated to a child in need of shoes in Africa. I'm an advocate of brands combining sales into a form of charity or donation purchase. However Skechers didn't even make the design of the shoes even a tad bit different. But has the saying goes, intimation is the sincerest form of flattery... I think.